Our Shockwave inflatable obstacle course is a huge 135' long inflatable obstacle course perfect for any party or age group. This 3 piece inflatable obstacle course fits together to make one super big bstacle course and will get anyone's competitive juices flowing with three different 45' long pieces. Our Shockwave inflatable obstacle course features beautiful style and bright colors, many size obstacles, hurdles, turns, climbs, dive throughs, climb overs and crawls. This is an amazing giant inflatable obstacle course is perfect for that over the top party or for places looking for high output like schools, churches and special events. 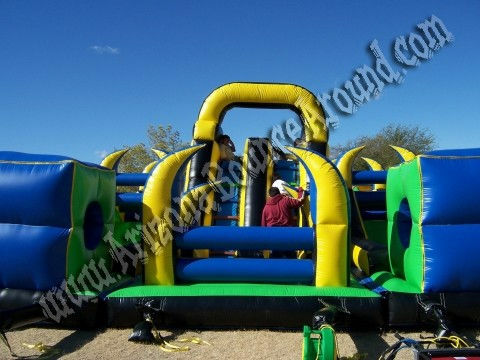 This Shockwave inflatable obstacle course rocks and features a 16' tall duel lane slide in the middle. You race through the 45' long obstacles, turn and climb the giant slide from behind then slide down to the end. Requires three separate electrical outlets on different breakers or generator rental. 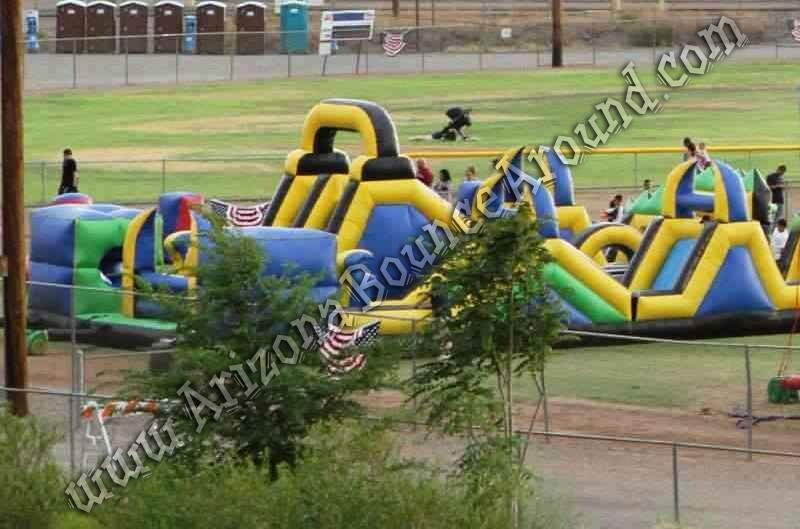 This Shockwave inflatable obstacle course rental price includes standard set up. Standard setup is considered a real grass area that we can stake into the ground within 80 feet of sufficient electrical supply. Delivery and removal within included delivery area with no restrictions for delivery, set up or pickup. 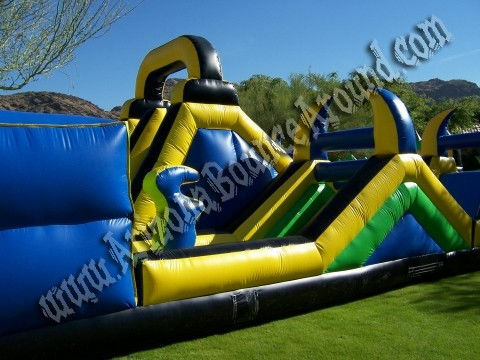 We do not set up this inflatable obstacle course on dirt or sand but it can be setup on asphalt, concrete or artificial grass by adding sand bags to your order. This inflatable obstacle course rental is designed to handle lots of kids and keep the lines down with the ultra high output. It's also great for private birthday parties or special events so rent it today.